Beginning as a mistake in an 1800s Parisian factory that led potters to witness crystals forming over the surface of their pots, Crystalline has evolved into a delicate glaze with a centuries-old fascination. 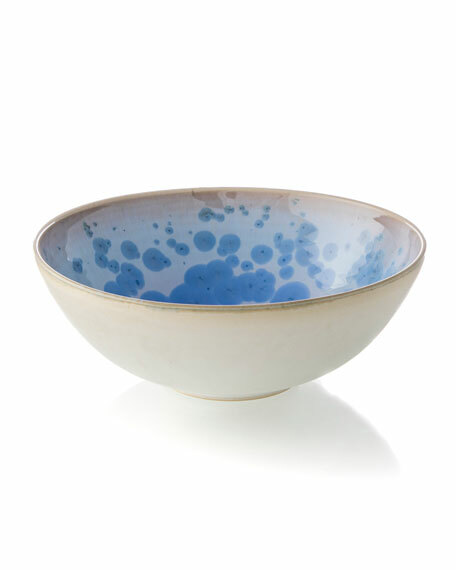 In the 1920s, as mass production flourished, a revival of this difficult but rewarding process led potters to form their own studios and venture deeply into the challenging art of Crystalline. The flowing nature of minerals in the process and the fact that only a handful of shapes and forms can support its unique character make Crystalline a symbol of craftsmanship. Realized correctly, celestial patterns merge with deep colors to yield a finish that is truly one-of-a kind. About Simon Pearce: Simon Pearce designs and manufactures original products in hand blown glass. Made in the United States, Simon Pearce, from inception, has maintained a dedication to creating products that are beautifully designed, produced with premium quality materials and time-honored techniques and intended for a lifetime of everyday use. The glass embodies traditional and contemporary stylesall with classic simplicity, elegance and everyday functionality.